Artifacts is all about healing souls, structured around the words of a surreal and half-remembered spiritual incident in Greece. But it is also about musical cross-pollination, blending melodies, beats and instruments from an arc across Africa, Asia, and Europe. This, Belgian-based Black Flower's third album, sees band leader Nathan Daems draw on his worldly travels and an excellent group of Brussels-based musicians to forge a very engaging record; starting us in the Horn of Africa before stretching across the Red Sea and Arabia to Persia, Turkey and finally hopping the Bosphorus to the Balkans. Black Flower have mastered combining modern western rhythms with an unexpected and wonderful array of instruments. The eerie horns of Alexandria combine baritone parps and klezmer-tinged cornet returning Woeter Haest's clavinet lines, all over a bouncing electronic beat. This Budos Band-esque groove slips into the tinkling ride and pressing bass of Helios Victor, replete with robust squawking, roaring saxophones, and long chord Zuton choruses. The end-blown flute is ever-present on Artifacts: the Balkan/Turkish Kaval features on the title track intriguingly juxtaposed with 90s club drum machines, booming bass and organ reverb; the Middle Eastern/Persian Ney pairs with the Daf (a rolling hand drum) on the atmospheric Realm and Era before Vandebril's bass transforms it into a psychedelic stomp; and the breathy Ney is delicately layered with a wailing violin and cornetto muto on closing track Lunar Eclipse. While there is much middle-eastern influence, it is still in the rhythms and flourishes of Ethiojazz that Black Flower really impress. The sinuous and shifting High Upon the Mountain High upon the Hill brings in Éthiopique sounds through its pentatonic descents and climbs, and notes which chase each other without coming up for air, Abeyo Zeybekiko a confident jaunty ethio-balkan anthem. However the album opener, Bones, is really the stand out track, having the honour of opening Gilles Peterson's 6Music slot on Saturday, too. Full of frantic flighty flute chopping its way over a regal rhythm section, Bones is an instant Ethiojazz classic – a ponderous Astatke homage which sounds both fresh yet familiar. 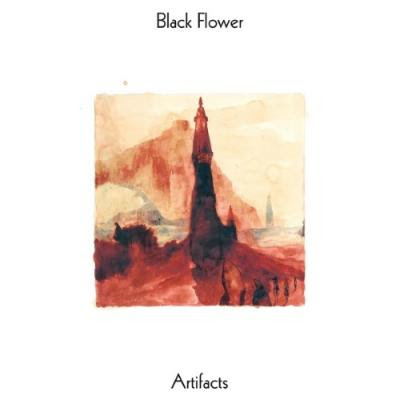 Artifacts is full of interesting composition, clean production, and a strong underlying groove. Daems and friends have put together a real mix of traditional instrumentation and modern electrical hums, and always with a reference lurking somewhere, whether to New Orleans hymns or 70s ska. This is listening music. Artifacts makes for a strong listen on the sofa, but I'm certain would also make a completely infectious live set.